Go to Taxes > Evidence in the left-side menu. In the list of location evidence, find the transaction you would like to edit. You can search by invoice number or customer name. You can also filter by date range and by the evidence status (e.g.- Not enough data, Conflicting data). Once you’ve found the transaction, click on it to open the Available data, which displays details of the customer and the location evidence on hand. Click the “...” button in the top right and select Edit. Here you can change existing information or add additional evidence. If you’re adding additional evidence, please type in the type of document in the field for Additional evidence type. 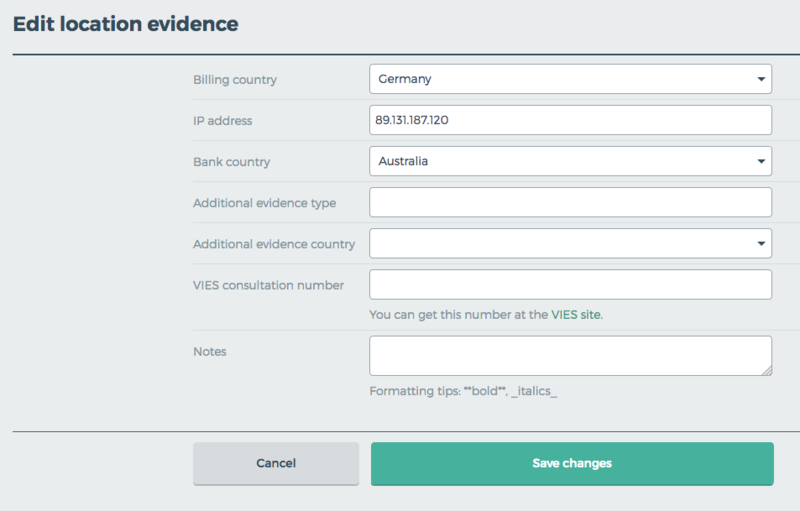 Then select the corresponding country in Additional evidence country. Ideally, you should also see that the location evidence is now Confirmed. Well done!